Add my additions to the MCMQG Round Robin Challenge. Not much else accomplished this month. I got so wrapped up in Gypsy Wife that I let Long Time Gone sit by the wayside. ... and applied the binding to 4 quilts. My time has mostly been applied to rearranging the house so that Mr. Hillside and I can occupy what we used to affectionately call the Queen Mother Suite. Reporting in with Patty D at Elm Street Quilts. I am a chigger magnet. 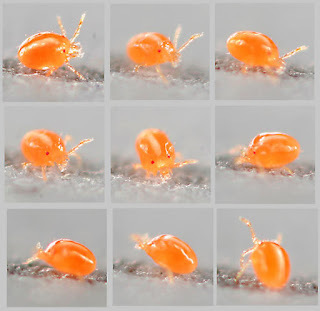 I have never seen one; they are almost microscopic. But I definitely know I have had an encounter with them. Mr. Hillside and I walked a property last Friday. He didn't get one bite, NOT ONE! Maybe it's because he's so trim and they prefer to munch on flabby folds. I am covered from head to toe. I didn't shower when I got home, and it was another day before I washed my bedsheets. The itch is enough to make me insane. Somehow I don't think I've seen the end of my neutral scraps. Look what came from Craftsy last week! In between all my retreat projects (read about those here and here), I cranked out a lot of checkerboard chunks and four more blocks for my Almost Gypsy Wife. An observant reader noticed a misplaced HST in Contrary Wife (thanks, Shirl S). Happy to report it has been fixed! However, I didn't have a picture of the block with me so apparently I created an entirely different block! And not just that one; I was also way off base with Cotton Reels, as well. Oh, well. My inspiration for this neutral version came from Pinterest. Nann (With Strings Attached) not only reminded me that the inspiration quilt was made by Jo Ann Bennedetti, she also sent me a link to another neutral beauty by Linda at Pieceful Kingdom. I love the black bits mixed in. I think I'll do the same. No, it wasn't really Epic. We were short a few people, in fact. But it seems like EVERYTHING else around Nashville is EPIC these days so why not an Epic Retreat? First we had the confluence of the CMA Festival and the Stanley Cup Playoffs in one weekend on Lower Broad in June. Epic. Then there was the 4th of July Fireworks that went on for almost 40 minutes, #1 in the nation according to some reports. EPic. Then we drew over 150,000 people to two soccer games in late July. EPIc. And, of course, on Monday, the Eclipse where we witnessed 2 whole minutes of Totality. EPIC! Anyway, the S'mores annual retreat was a great success, much fun was had by all who were able to attend. And several nice projects were finished or started. So here's the parade (warning - photo heavy). Sandy and Diana had small hand projects and Kristen, who's also a paper crafter, made cute little flowers for us to stick on our machines. Yes, two Senas -- mother/daughter. And Kristen is Donna's daughter. This was one of those retreats where almost everyone worked on only one big project. I guess I was the exception. Scroll back through my posts to see what I worked on. Started the day by making joins on the bindings I applied on Day 1. Next up was Alycia's A-6 Mystery. After piecing a couple more background squares I was still two 9-1/2" squares short. I debated about taking the top row off and stealing two squares from it. I put all the blocks on the design wall and studied it while I ate lunch. Consulting a friend, we came up with a solution: take two HSTs from each corner and put the two background halves together to make whole background square. I will replace the corner background fabric with something different -- maybe a gray or maybe something entirely different. It just seemed logical that the area on the outside of the blue and red bands could be intentionally different. As I was working on A-6 I built a bunch of checkboards and four blocks for my not-quite-Gypsy-Wife. These are all 6" blocks, clockwise: Contrary Wife, Dutchman's Puzzle, Counterpane, Cotton Reels. Tonight will be 1 Lump or 2? Stay tuned. Spent the entire day working on this wall hanging (or maybe it's a throw) for my sister-in-law. The panel, trees, and blue border are by Robert Kaufman Fabrics. It seemed simple enough until I realized I needed to miter the grove corners. Then I had machine problems with the blue border which required pulling out the seam ripper. It will finish about 50" x 60"
Tomorrow I will redesign Alycia's A-6 mystery to make up for the missing background squares. Sharon is also doing the mystery; her background is an ancient mariner print. I'm having trouble uploading a picture; will try again tomorrow. At least that's what it felt like when I left for retreat about 5 minutes before totality (I had been watching on TV for several hours). The streets and interstate were almost deserted! It's been a productive afternoon and evening. Four quilts now have binding. Well, almost. Still need to do the joins but I don't think my brain can handle that at 10:30 p.m.
we get together periodically because we like to eat, laugh. shop, and quilt S'more. Since this retreat began at the hour of the Epic Eclipse Totality, I assembled an assortment of Eclipse-worthy snacks to share with the group. Sundrop soda, Sunmaid raisins, Starburst candy, Moon Pies, and eclipse gum. Someone else stopped at Krispy Kreme for Eclipse doughnuts. They didn't last long, but weren't nearly as good as they sounded. I have four quilts to bind, a couple of UFOs to wrap up, and a new wall hanging to make. I will be using my Gypsy blocks as leaders and enders. 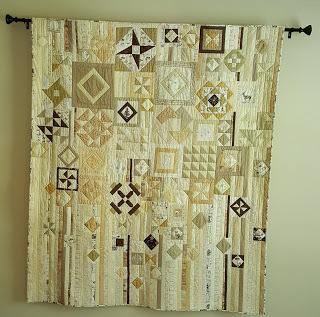 I made absolutely no progress on my neutral Gypsy-ish quilt last week --- other than getting the finished blocks pressed. I'm liking the effect, seeing them all together. Neutral - in the style of "Gypsy Wife"
Monday was catchup day from our trip to Savannah with laundry and all that goes with it. Tuesday I got emission test, tires rotated, and renewed my tags. Actually, got a NEW tag! GS-3 is on the autism spectrum and I am so grateful for all the support and therapy he has received. AND I drove to the next county to pick up a quilt from the LAQ. I have no idea where Wednesday went. Oh, now I remember ... I finally started working on the round robin (due on Saturday). This one was a puzzler. (Sorry, I thought I had a before picture.) I had an idea of what I wanted to add from something I had seen, didn't take a picture when I saw it, and couldn't remember how it went. After a few false starts, I called the shop where I had seen it, but the gal there was clueless (though she did try). In the end I went with a bit of improv inspired by the quilt's originator. My addition is the top and left side. You may be able to guess whose quilt this is. Thursday I was able to make several bindings before heading out for an afternoon of bridge. Friday I took Mr. Hillside to the retina specialist for a follow-up visit. The drops have helped, but he still needs to continue the drops for another 6 weeks. Saturday was the Music City Modern guild meeting and destashing yard sale. I wasn't going to buy anything but a fat baggie of neutral scraps was calling my name. In the end it was free because the owner of the neutrals bought a book from me that cost more! The scraps are all washed and pressed, and I've started cutting/kitting 10 more blocks to take to retreat this week. I've heard about Little Free Libraries, but this is the first one I've seen. A friend who recently retired was looking for a project. Each one is registered and the location mapped on the website. now people have added books of their own when they stop to choose a book to read. The book you choose can be kept, passed on, or returned. We have a box of books ready to be added to Little Free Library #60573. Go to the website and see if there is a Little Free Library in your neighborhood. Look what I picked up today! The pattern is Robo-Cats, started in a Power Cutting class in 2005. It hasn't been trimmed yet, so I just draped it over the loveseat to show it off. It's probably one of the first really scrappy quilts I ever made. I love the split nine-patch blocks. I also love the mix of animals in the border. Can you see the lime green dragonflies in the panto quilting? Whooping it up with Confessions of a Fabric Addict. I was able to get four more neutral blocks done for my "Gypsy Style" quilt while DH and SIL were out running errands yesterday. (I wrote about the first batch of blocks here.) These are all 5". Puss in the Corner II - 5"
Red Cross II - 5"
Strength in Union - 5"
All the block names are from 501 Rotary-Cut Quilt Blocks. Having everything cut and kitted ahead of time has been a good plan so I think I will continue that way -- maybe spend a day cutting 10 blocks, then work on a couple every day. Because these are scrappy AND neutral, I'll be linking up with ScrapHappy Saturday. In an earlier post I alluded to the fact that I am planning an all neutral quilt. I am doing it "in the style of" Gypsy Wife, based on a photo I saw on Pinterest of one done in neutrals. I can't find the picture now, so if you know whose it was, I'd love to give credit where credit is due. 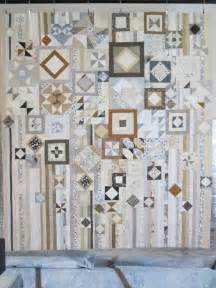 I am using Judy Hopkins' book 501 Rotary-Cut Quilt Blocks as the basis for my blocks. I figure surely, out of 501 blocks, I can find enough to fill a quilt. So the quest has begun. The first two days in Savannah I sorted through my overflowing neutral bin. First I separated things into three piles: light, medium, and dark. But I felt I was just wrestling with the piles. So then I decided to separate into sizes: less than 1-1/2", 1-1/2", 2", 2-1/2", small chunks, and fat quarters. My thinking was I should use the cut bits first. But most of the time the cut bits were not sufficient to make a whole block. I did, however, make some headway and got 10 blocks cut and kitted. After I cut a massive number of 1" HSTs for just a couple of blocks, I remembered the Magic 8 trick (thanks, Gayle, for the reminder). So this is today's tally (apologies for the wrinkles, threads, and hand-written captions). Block in a Box - 6"
My plan is for each block to be different; however, I may change my mind on that as I go along. I'm also sticking with 4", 5", and 6" sizes. There will probably be some filler bits along with the vertical stripes. I believe I need to look in my stash for more darker neutrals. I'm trying to stay in the tan family and not go to grays or pastels. I'm not averse to including some pattern in the print. I suspect this is going to be just as addictive as Jen Kingwell's other pattern, Long Time Gone. Sheesh, what have I done?